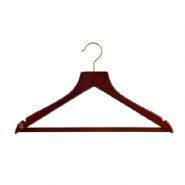 These FSC certified mahogany jacket hangers are a hotel wardrobe essential. A little sturdier than your average hanger, these wooden coat and jacket hangers are designed to handle heavier clothing and feature a non-slip cross bar.. They're the ideal hangers for using in your hotel reception, restaurants or coat check facilities, or if you often run functions which require coat storage solutions. 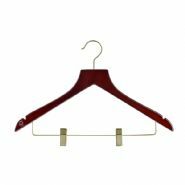 These luxurious mahogany chunky jacket hangers are all made from FSC (Forestry Stewardship Council) certified wood so they're just the thing for hotels which pride themselves on their environmentally friendly credentials. These heavier-weight hangers are glossy mahogany and have a subtle FSC logo printed on the front so you can keep your hotel guests informed of your eco-friendly agenda. Available with either chrome or gold hooks.